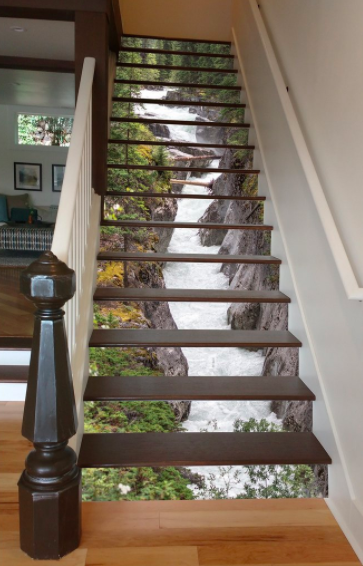 If you live in a two-story home or apartment, have you considered the full potential of your stair area? 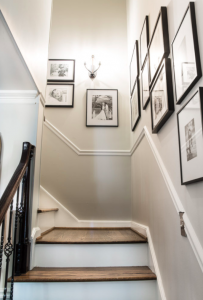 Come along with us as we explore stairway design ideas that allow you to make the most of that space, whether it be the walls, risers or even underneath. 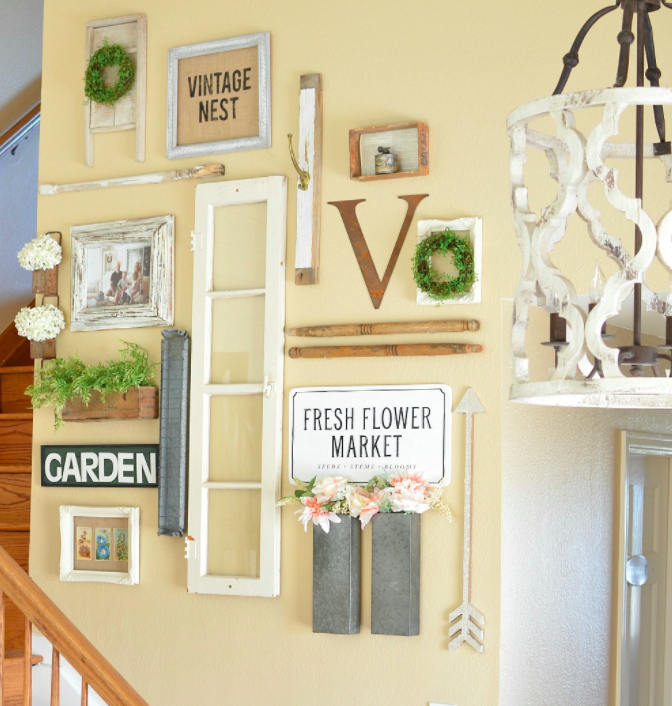 For those of us who love to decorate our houses, we can get really excited when we find a new area of the house that could do with an overhaul. 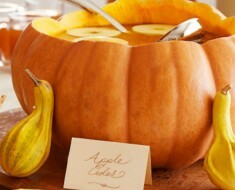 The chance to exercise our imagination and creativity gets us all in a tizzy! 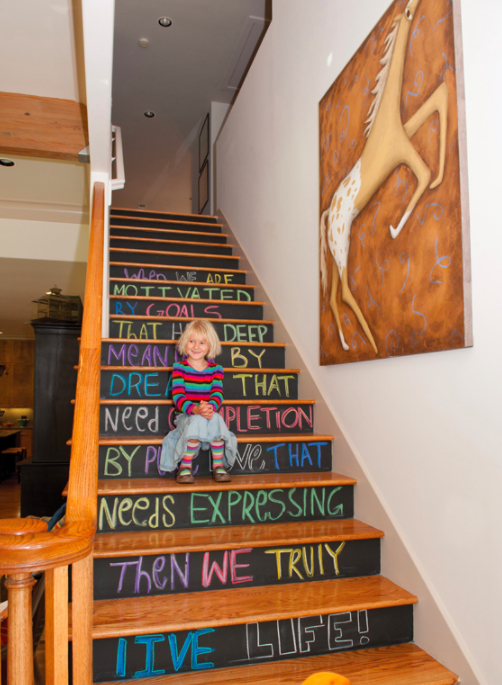 But, the stairs in our home sometime don’t get all the love that they deserve. 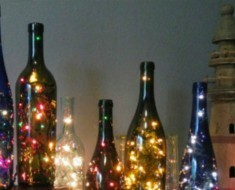 They are seen as more functional than pretty and are often the last thing that receives much decorative attention. 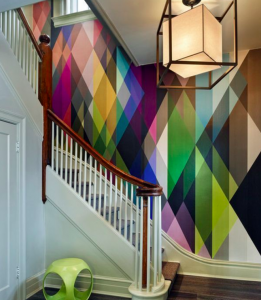 We are noticing that many designers are finally starting to pay attention to stairways, treating them as significant architectural features that don’t have to be cookie cutter and builder grade. 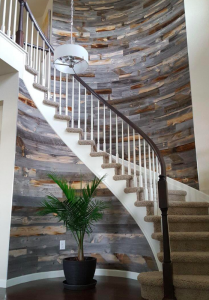 Even if you don’t have the flexibility to be able to completely overhaul the structure of your stairs, there are so many things that you can do to give them new life and better utilize the areas on, around and under them. And for those of you who rent, or just like to switch things out once in awhile, many of these ideas can be temporary and easily removed or changed if necessary. Go ahead and give this often ignored space the attention that it deserves! 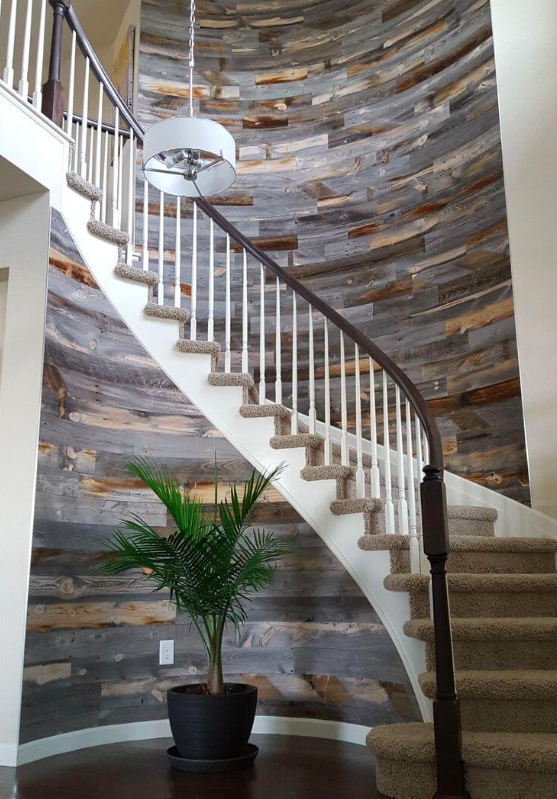 Let your stairway design reflect your personality and take advantage of that often overlooked space. 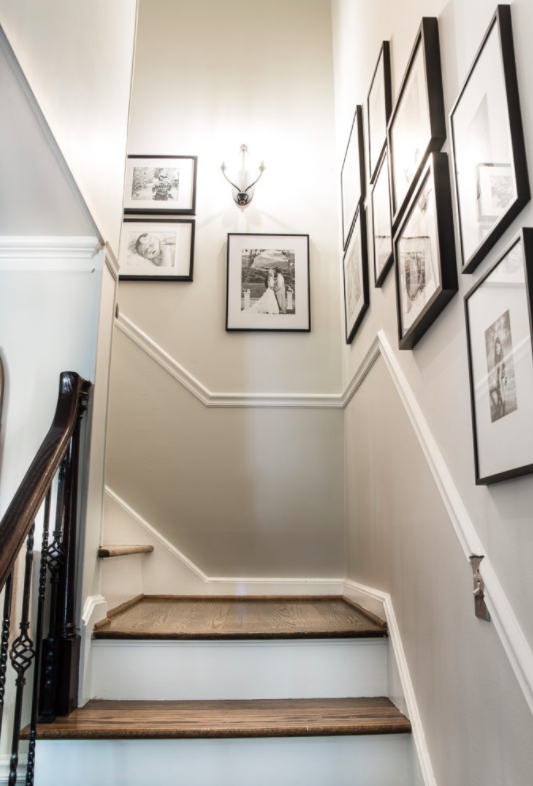 The large wall space going up the stairs is a giant canvas, just waiting for you to put your personal stamp on it. Here are some ideas that are easily within your reach. 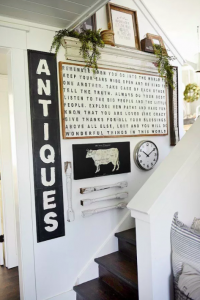 1 – This approach allows you to truly personalize this area, giving you space to display treasured collectibles and keepsakes. 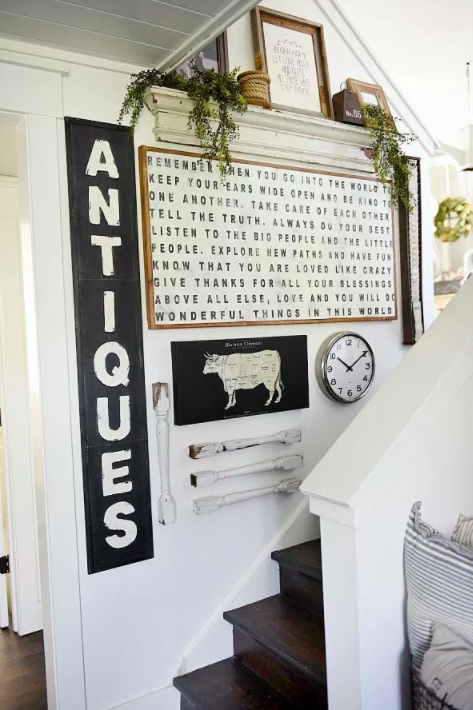 3 – This timeless look is right at home in spaces of many different styles… traditional, modern, farmhouse and elegant. However, getting the right placement can be tricky. Learn the rules at Bless’er House. 4 – Stick-on murals like this one command attention and need no other embellishment. They are available in designs to satisfy a full catalog of color schemes and themes. 5 – These are real wood planks that are thin enough to bend, if needed. Applied with adhesive, they offer an easy and quick installation. 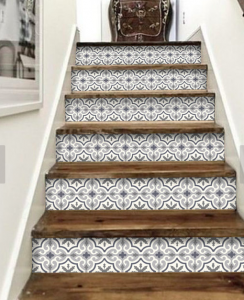 Don’t forget the risers in your stairway design! The right treatment can be a real decor statement and help hide common scuff marks too. 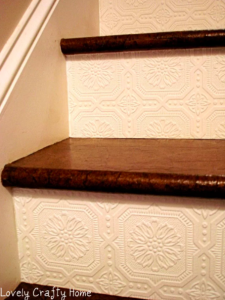 6 – Textured wallpaper gives a vintage, cottage feel and can be left white or painted. 7 – Peel and stick decals come in loads of patterns and could be ideal for a temporary living situation. 8 – Chalkboard Paint allows you to express your creativity as often as you like. 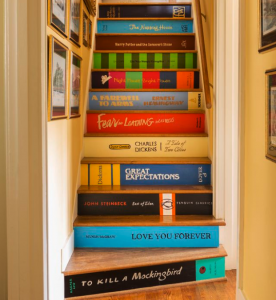 9 – This Custom Paint treatment shows that books are the favorite pastime in this home. 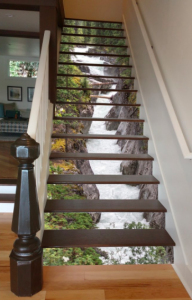 10 – Riser Murals offer another removable option and let you display stunning photography underfoot. 11 – This colorful license plate collection adds rustic personality and chronicles the journeys of the owner. If you are building, renovating or have an existing under-stair closet or cubby, think about making the absolute most of this additional square footage. 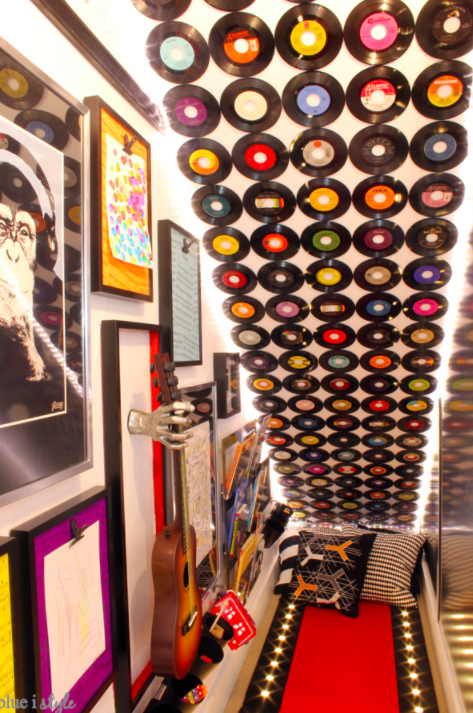 12 – A closet under the stairs is turned into a style-packed themed kids’ hangout/music studio. 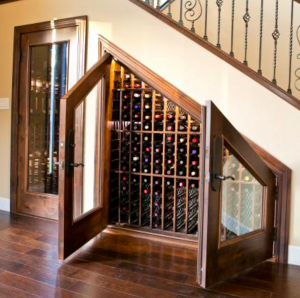 You won’t believe all the amazing details in this hidden space. 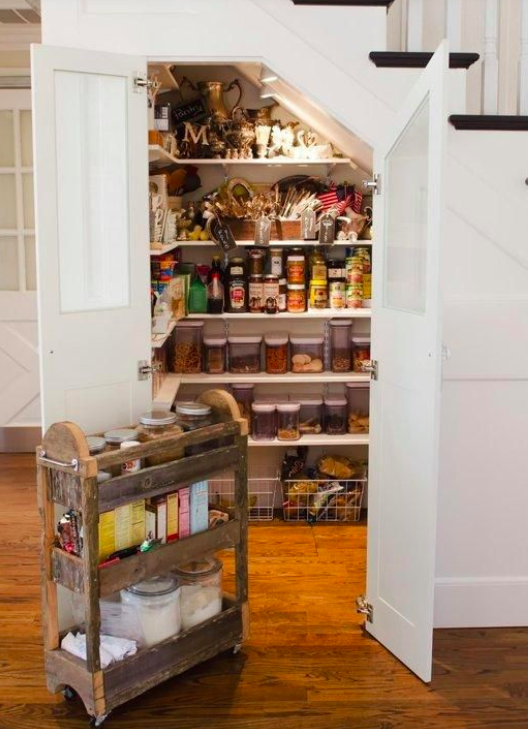 13 – Form and function reign in this convenient pantry space. 14 – If you are a wine lover, what better way to display and protect your collection. 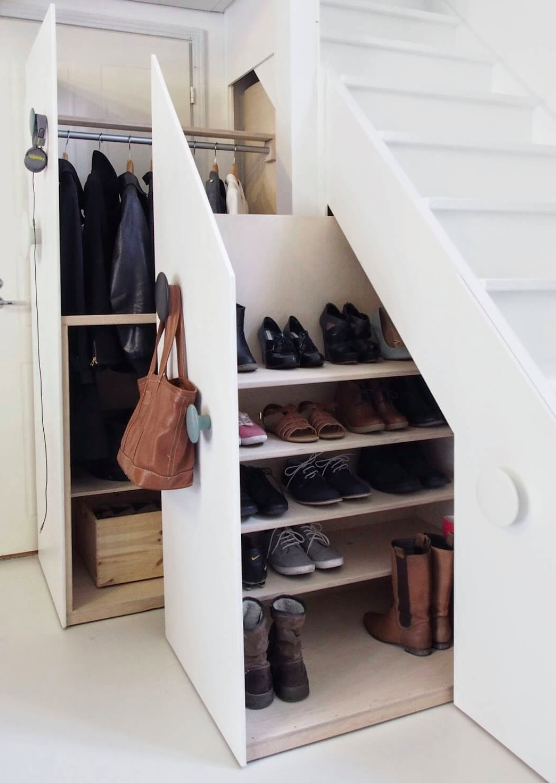 15 – A slide out closet is a brilliant way to add storage and take advantage of the spaces with low head clearance. 16 – Give your dog the coolest pet crate on the block, complete with sliding barn doors. 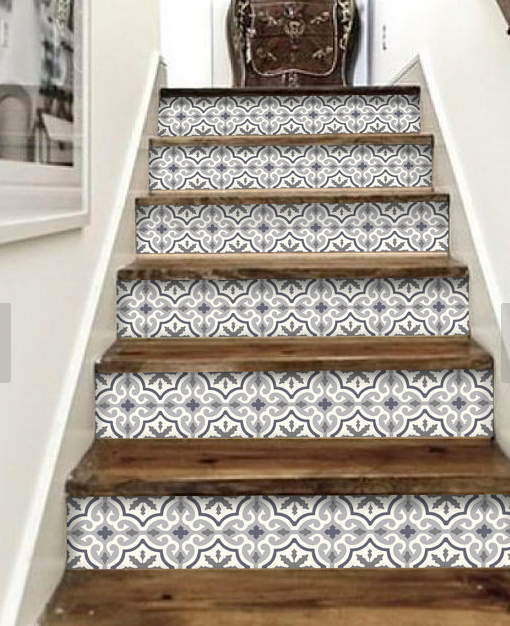 Your stairs can take on a new life without a complete overhaul. Give the traditional railings and spindles a makeover to something unexpected for a completely new look. 17 – You don’t need a boat to use rope. 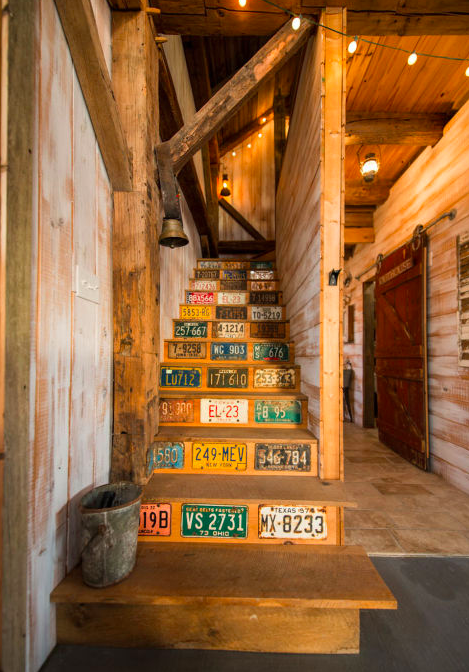 18 – Rustic meets modern with wood in an “x” pattern paired with horizontal steel cables. 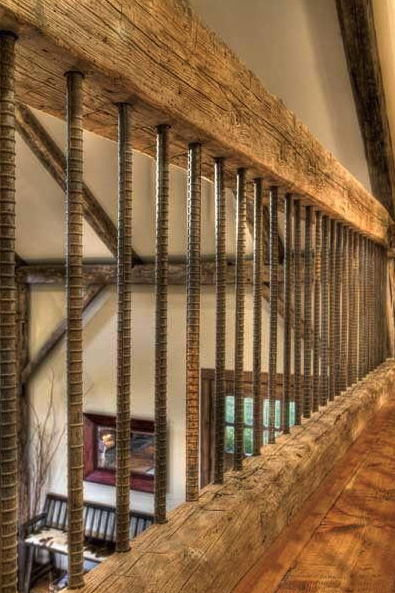 19 – Rebar recycled into this landing area becomes a focal point of the home. 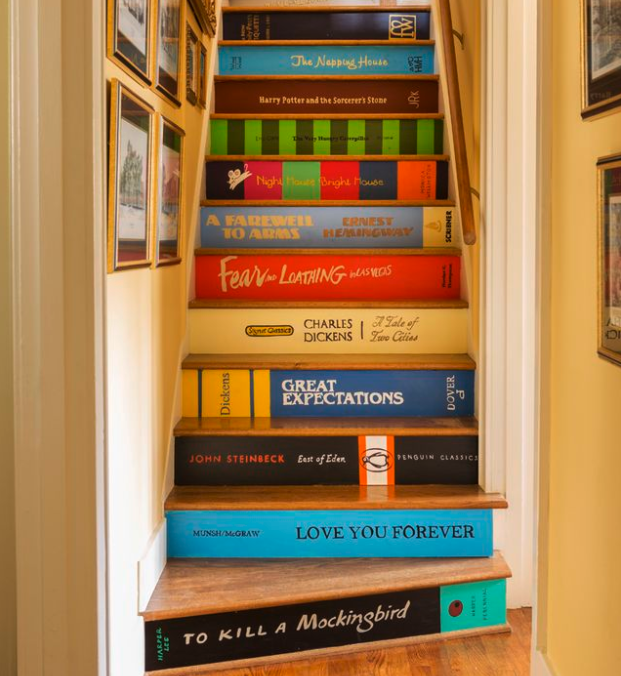 We hope some of these ideas have inspired you to consider the possibilities of your stairway design. 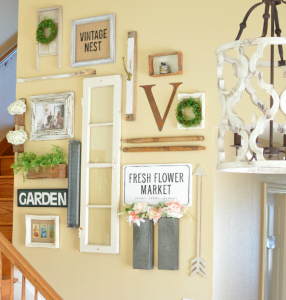 With a little creativity, this area can be transformed into a showstopping feature of your home! 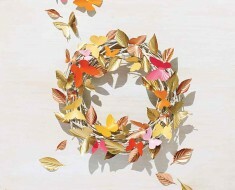 Thank you so much for visiting AllCreated.com. 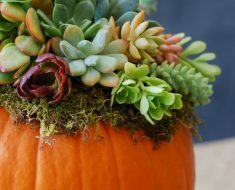 Be sure to pop over to our site regularly to see recipes, crafts, DIY & inspiration, chosen just for you. 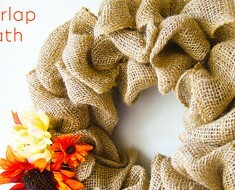 We post loads of new ideas every week! 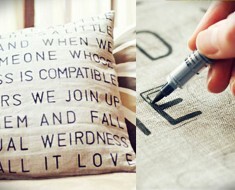 Your Favorite Quote And A Marker And You Can Have A Bit Of Fluffy Inspiration!